The severe winter ice conditions, particularly the spread and thickness of sea ice extent, have again drawn great interest in the unusual cold of last winter, as well as the associated strong ice forming. 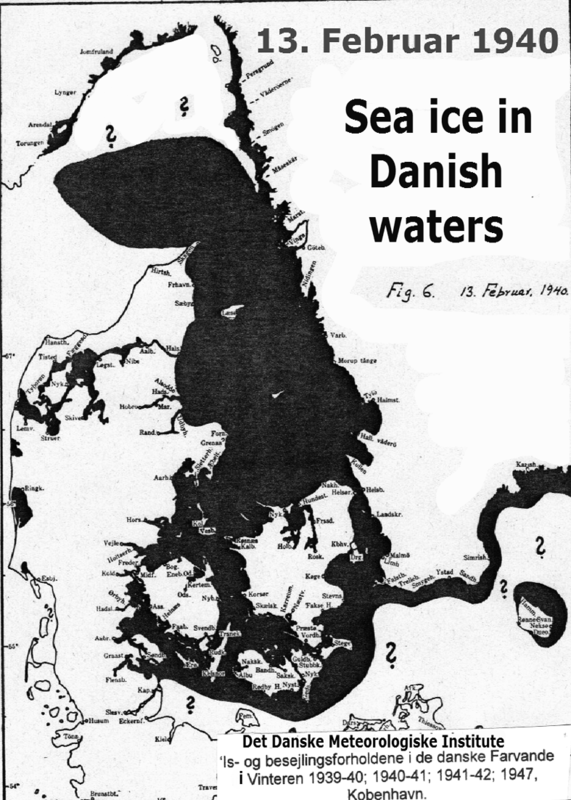 At the end the 25 page report he lists the severe winters during which the Swedish coast was entirely covered with ice. During the 70 years of regular observations it happened only eight times, five times between 1870/71 and 1892/93, and during the winter 1916/17, 1923/24 and 1939/40. 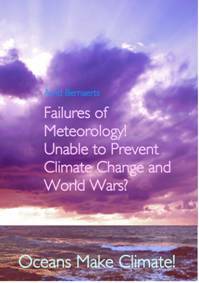 The sea ice conditions during the extreme war winters are part of the evidence that proves naval warfare to be a contributing culprit. General Frost would not have had that leeway to reign with arctic conditions over several months in winter 1939/40 without the serious decrease of heat potential of the North Sea and Baltic too early and sustained. It happened three winters in a row, and each of them is a thrilling subject for any keen climatologist. The ice winter 1939/40 is the most interesting of these three, although from the point of severity the third winter even succeeded the first. The first winter produced record ice conditions in the waters off the German coast in North Sea and Baltic, because most of the naval activities had been there. By far the heaviest icing occurred in the eastern Baltic in the third war winter because the German Kriegmarine and the Russian Baltic Forces battled for supremacy since June 1941 until the sea ice prevented further sea going six months later. However, beside of any similarities, or distinction between these winters, the winter 1939/40 is the most important one of all because it was the first of three in succession, and the first after more than half a century that closed the entire Baltic. This situation had not happened since 1883 (Fig. B-16, p. 34), although every text book and the IPCC claim that the world had been getting warmer since the 19th Century. Only during the first months at war, and the first war winter the marine environment had been in its long-term natural state, and the recorded data had still been free from a mixture of data and records that had already been altered by anthropogenic intrusion. The naval war activities were more confined, close to the navy’s home base areas during the early months of the war than later. From September 1st until the fall of Gdynia , in the Baltic off Poland ’s coast, up to a hundred naval vessels and coastal batteries shelled each other for about ten days. From here along the southern Baltic, and in the North Sea up to the sea border with The Netherlands, the stress on the sea was immediately exceptionally high, due to activities such as: surveillance, training, mining, mine sweeping, shelling, bombing, depth charging, and transport. The longer the war lasted the more naval activities intensified, and they varied largely in timing, distance, region, and location. Mentioning different preconditions, relevant to the sea icing process, will be necessary. The ultimate goal is to convey evidential correlation between naval war and the exceptional ice conditions. It seems not to be easy to find a better test field than that, as any change of sea conditions during the winter season is likely to be reflected in statistical data and records. The start is made by a briefing about the usual icing situation during winter, followed by an outline of the main naval activities including a number of illustrative examples, to prepare for a detailed discussion of certain situations, and/or events. Over 250 years of modern sea ice recording in the Baltic by Finish institutions, there had been only 15 years that reached the highest mark, and the winter 1939/40 was the first one in the 20th Century (Fig. B-16, p. 34). The eastern part of the North Sea from the Skagerrak to Belgium saw a lot of sea ice as well. 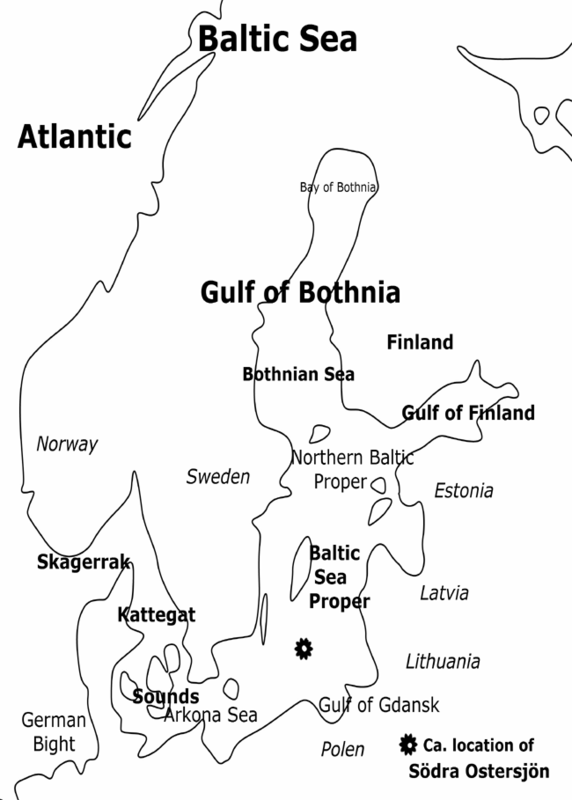 In the eastern Baltic a considerable distinction can be seen between the northern part in the Gulf of Bothnia, the middle part with the Gulf of Finland (Baltic Proper), and the southern part from Klaipeda to Kiel . Here in the south the deviation from average appeared first. At the Greifswalder Bodden (an open bight SE of the island of Rügen ), icing started on December 18, 1939 , solid ice remained in place without any interruption until April 4, 1940 , and the last ice disappeared on April 11, 1940 . In the high north inland icing started a bit earlier than usual. The forming of solid ice in the Bay of Bothnia , the north of the Gulf of Bothnia , followed the usual pattern in time and extent. More exceptional was the icing of the Gulf of Finland , which remained fairly open for a long time although since mid December very low temperatures prevailed. On November 30th the Russian Baltic Fleet and the Finish Navy and coastal defence facilities commenced fighting for supremacy until the Gulf very rapidly became ice covered during a cold wave from January 14 - 24, 1940 (Jurva, 1959). On the other hand the ice had been so solid between Turku and the island of Åland about 2½ weeks earlier than usual, so that it became an ‘ice-bridge’ between Finland and Sweden . The distinction between north and south is also reflected in the deviation of ice thickness. 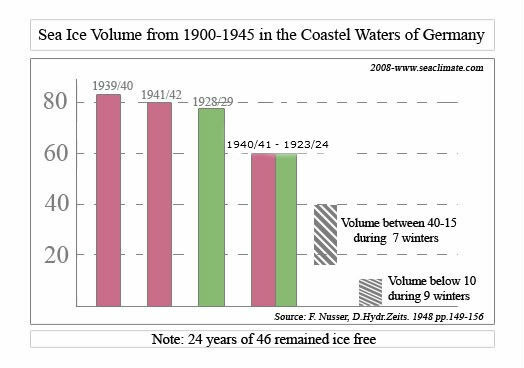 In the Gulf and Sea of Bothnia ice values increased merely by about 10-20%, while in the middle and southern part of the Baltic ice value doubled from about 25-35 centimetres to about 30-60cm (Oestman, 1940). 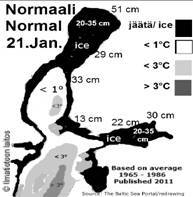 In the fairways of Gotland the ice thickness was 50-60cm, although the normal value is only 17cm. The harbours along the Swedish coast became free of ice about two to four weeks later than usual, e.g. Stockholm on April 30th, instead of April 1st. (Oestman, 1940). The western Baltic and the eastern North Sea deviated even stronger from the average. The small rocky island Heligoland (in German: Helgoland) in the center of the German Bight, where a huge part of the Kriegmarine was assembled and operated, got its first day of frost on December 7th and recorded a mean temperature from the period from December 13th to 19th of –1.6°C. 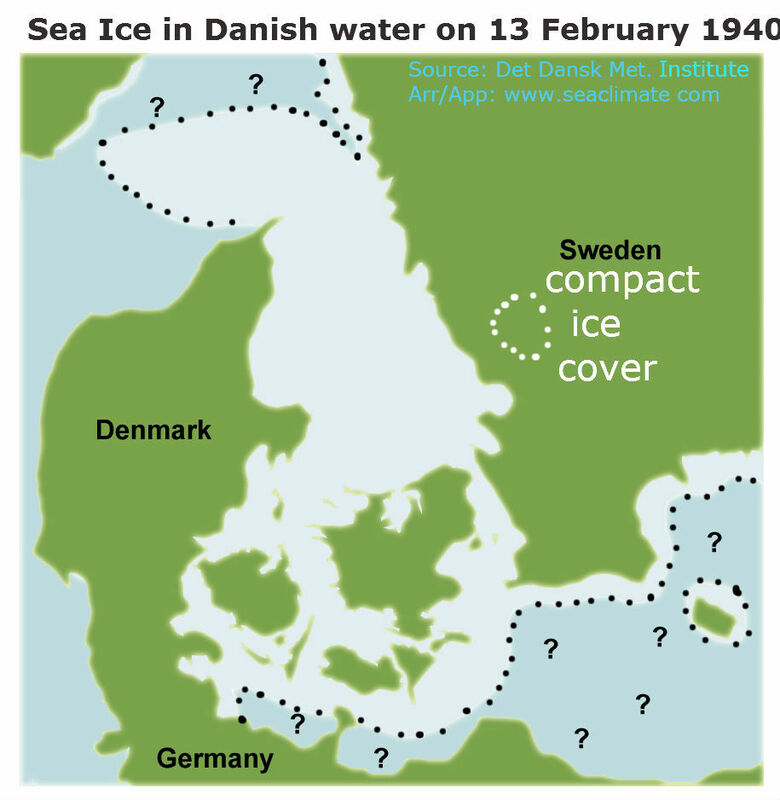 On the mainland sea ice appeared on the river Elbe on the 16th and at the sea coast on December 17th 1939 . Immediately north of the Elbe delta the ice stayed continuously for 100 days and along the south-west coast towards Holland for 60-70 days. The situation was similar around Denmark . Frost started in the middle of December, interrupted by some milder days until January 13th to 15th 1940 when a sudden fall of temperatures set in, and remained with low degree temperatures until about the forth week of February. During this period of time the ice cover has increased by 0,8cm per day until February 22nd. In the inner and closed waters, and some fairways the icing remained contained from mid December to mid January when sea icing spread out far into the sea, closed the Kattegat and sounds completely and extended out far into the Skagerrak . One Danish ice station reported a maximum duration of 115 days, 34 stations had 100 days or more and 99 stations had between 75 and 100 days. 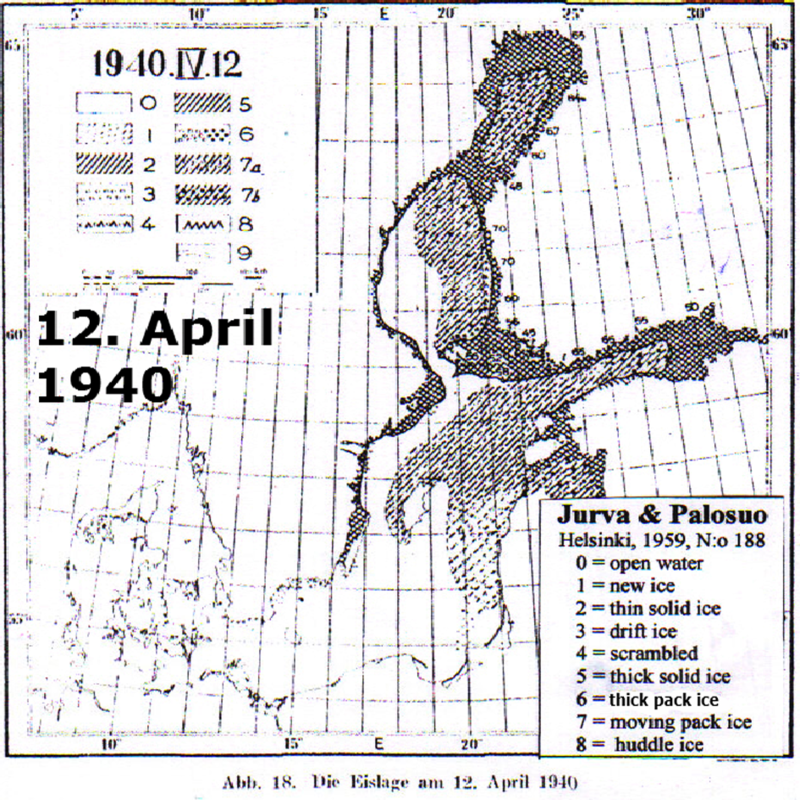 The last ice was reported in the sounds on April 19th 1940 . The ice was the thickest in the days around February 21st between 40 and 60 cm were observed at 16 stations (Det Danske, 1940). Across the Skagerrak and Kattegat the ice thickness along the Swedish coast showed double normal values (Oestman, 1940). Fig. C7-3; Illustrating the loss of the summer heat. The Bay of Gdansk has a maximum water depth of 114 meters, which means that the sea surface layer over the first 30m in early September is warmed to almost 20°C, decreases down to 60m to about 10-15°C, and has a stable temperature level of around 5°C below the 60 meter level. In this sea area Germany started the war on September 1st 1939 . The WWI veteran the battle ship “Schleswig-Holstein” began shelling of the Polish outpost at the Westernplatte with its superior 280 and 150mm guns at 04:45 A.M. The Polish defenders had been less well equipped but did everything possible to return the shelling. What madness to the marine environment. The “Schleswig-Holstein” was not alone, but accompanied by an armada comprised of about four dozen naval vessels. It took 13 days before the defenders of Gdynia had to cease their resistance. Thereafter, other positions along the Polish coast were shelled from the sea as well and they returned fire. Also their defence was in vain. After two German battleships attacked Hel (Gdanska Bight) for three days from September 25-27, the last Polish coastal defence position was silenced. Within four weeks, the Germans had brought the entire Southern Baltic coast under their sole control. How many of the several thousands of tons of ammunition fired exploded on or under the sea surface is difficult to assess. Substantial areas of the affected sea were certainly stirred and mixed heavily. (b) Winter season: forcing the release of more heat from the sea body than it would occur in calm weather, or the water column over several meters depth would not be mixed. The disinterest in understanding the mechanisms thoroughly is appalling. No other sea in Europe offers comparably easy study conditions. The Baltic with a size of 400’000 km² and an average depth of only 55m has a completely different type of ocean conditions. It is also different and less complicated than the North Sea, which is directly connected to the Atlantic Ocean System, with tides, and a high salinity (max. 32psu)*, correspondingly with a great variation of salinity due to a number of circumstances. 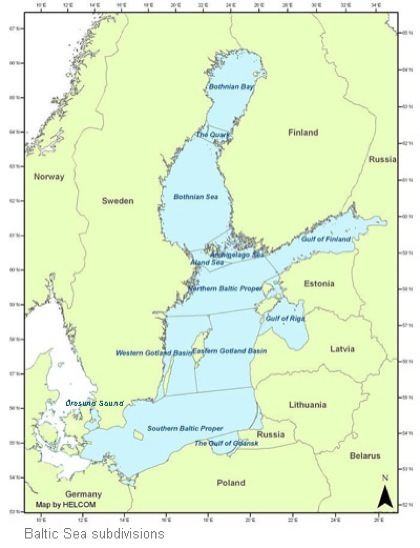 Instead, in the Baltic Proper the salinity ranges from about 6 to 8psu and between 10 and 15psu at 40 to 70 m depth. The salinity steadily decreases towards the North and East, and is virtually zero in the very north (Palosuo, 1966). Nevertheless the confinement of the Baltic and its location at high latitudes, make it an ideal subject to study. When the surface looses heat, its density increases and vertical mixing increases. Most of the heat stored in the sea water body until the end of August, is lost to the atmosphere by the end of the year. Even some sunny days in September and October can no longer compensate for heat disappearing. On the other hand, cold and saline water is heavier than warm and less salty water due to higher density. This largely prevents the deeper water layers to be part of any vertical (thermo-haline) convection, which is in so far limited to the upper level covering a depth down to 40-60 meters. But naval activities such as shelling, sinking vessels, sea mines are able to force changes at any depths, and in locations where the wind would never be able to force mixing. Even a strong wind cannot generate very high waves (>10m) in the Baltic, and any forcing does not exceed the 15 meter depth level and that only on very few occasions during one year. The southern Baltic coast between the Kiel and Gdansk covers a distance of about 700 km. The sea is shallow, with less than 50m depth in the western part, and slightly above 50m in the eastern part. In the most western part close to the Sounds and the Kattegat the water body has the highest amount of salinity. In the middle is the Arkona Basin that has a range of 10 degrees in water temperature over the depth of 40m in early autumn. But neither the Kriegsmarine nor science cared. From September 1, 1939 onwards the German Navy was navigating these waters extensively. They employed an armada of naval vessels in the Bay of Gdansk , they shelled military posts along the Polish coast, organized huge transportation activities eastwards, undertook many surveillance missions, and used these waters to train tens of thousands of their naval personnel, including training in operating batteries by firing shells into designated sea areas. Many mine fields had been laid. From now on daily incidents regarding the sea properties became the order. The Germans had many thousand sea mines in place as soon as the war commenced, and continued to lay many more. An early victim became the 1,555-ton Greek ship Kosti when it hit a German mine two miles south of Falsterbo/Sweden on September 4th in a “terrific explosion” (NYT, Sept 05, 1939). Even though the eastern Baltic was crowded by German naval vessels, the hard-pressed Poles managed to drop 60 mines south of Hel (Gdanska Bight) on September 12th by their minesweepers Czajka, Jasolka and Rybitwa. The Germans even sunk their own ships, as three examples may illustrate: „A report from Falsterbo, Sweden, today said that a German pilot boat was blown up south of Oresund when it struck its own mine “ (NYT, Oct. 17, 1939), that a German Coast Guard ship sank south of the Great Belt in November (NYT, Nov. 26, 1939), and in an incident in which a German mine patrol ship was blown up in a German mine field off Denmark sinking in less than two minutes (NYT, Dec 05, 1939). · September 24, 1939 ; Snowfall in Baltic countries. A low pressure (1,000mb) originated in the western part of the Gulf of Finland, with wind force 6-8 Beaufort near Sundsval and Åland Island . · September 26, 1939 ; Temperatures: at Rügenwalde (small city at the Baltic coast, 150 km west of Gdynia ) on September 26th -0.4°C; on 27th +1.5°C; in Koenigsberg/Kaliningrad 25-27th (+2.5°C to +1.6°C); Putbus (Rügen), 24-29th (+5.2°C to + 3.8°C). · September 27, 1939 ; Hamburg –2.5°C. · October 11, 1939 ; a high pressure area over Finland brings cold air of arctic origin to East of Germany, Königsberg ( Kaliningrad ) - 3°C average. Within the range of this cold air first light snow occurred in the Gdynia Bight. Actually, Königsberg had already experienced -1°C on October 04. · Mid-October 1939: Some lakes and rivers froze in Northern and the middle of Norrland/Sweden, as well as in NW of Svealand (Middle Sweden), which usually happens only towards the end of the month. · November 01, 1939; Together with the first snow showers in the eastern Baltic, cold air had been carried as far as the line Bohemia – Heligoland Bight. Icing of the southern Baltic region started very early and was particularly severe, Gdansk (12/12), Travemünde/Lübeck (17/12), and Flensburg (28/12). The ice lasted for between 60 and 100 days and in Gdansk until April 1940. As the ice maps prepared by the German services have been lost, and those from other services did not cover the German coastal areas, it does not make much sense to discuss this region any further. “Gales have loosened several hundred mines in the German mine fields… drifting mines exploded on the coast near the suburbs (of Copenhagen ), breaking windows and with their terrific detonations frightening citizens. Naval crews have destroyed no fewer than forty-three mines from Koege Bay up to Amager Island , where 100,000 Copenhagen residents live in a district comparable to Brooklyn . Along the whole southern coast mine alarms often make it necessary to evacuate villages while experts discharge or explode the mines. So many mines are floating around that it is impossible to destroy all of them in the bad weather” (NYT, Nov 06 1939). In December the two Swedish vessels Torö (1467 BRT) and Algol (978 BRT) are lost on Swedish mines. Winter came early. Some frost occurred about the middle of December with the lowest air temperature reported for December as –22,2°C (Det Danske, 1940). Also the sea showed wintry conditions early. On November 19 and 26, 1939 the Danish Light vessel Anholt Knob ( Kattegat ) reported snow fall and from December 18 to 31, 1939. During the last week in 1939 most of the Danish light vessels reported permanent frost (max -6.3° Lappegrund). 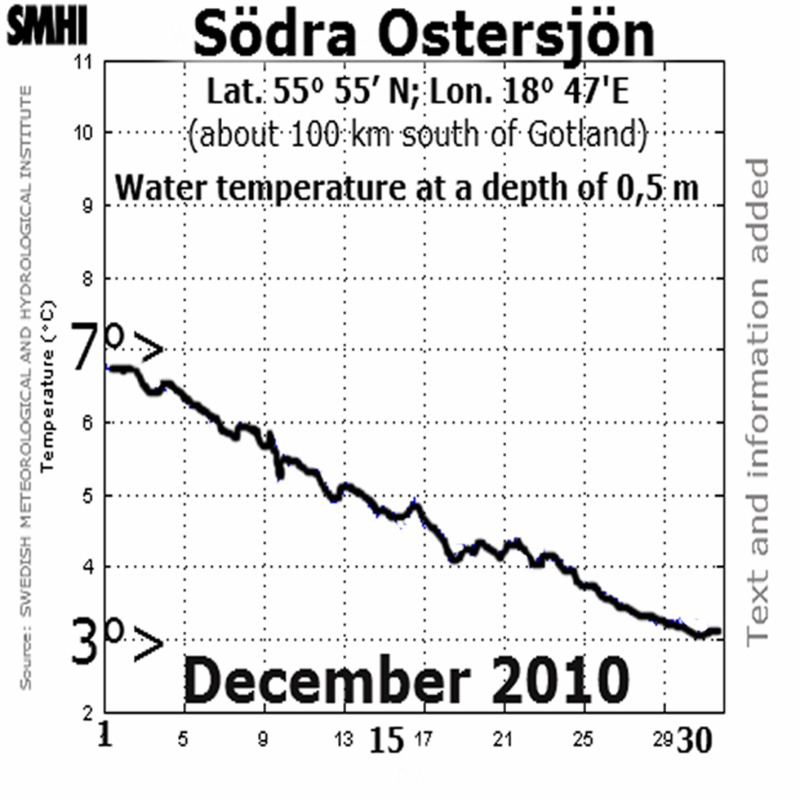 Simultaneously the sea water temperatures dropped to below zero degrees Celsius, about 4 to 6 degrees below average (e.g. : Aalborg 5 days (max low -1.6°C), Rodby Havn 7 days (max low. –0.6°C), Fredrikssund 7 days (max low -1.8°C), Klinth Havn 3 days (max low -0.5°C). About the middle of December the first ice was reported. The number of days during which sea ice has been noted stayed for up to maximal 115 days. Due to the heavy sea icing all light vessels were withdrawn and remained in port until late spring. The last ice was observed in the Sound on April 19th, 1940 . The Germans were keen on preventing any enemy ship entering or operating in the Skagerrak area. They feared that naval vessels could reach the Baltic. For that reason they themselves operated in the sea area, flew bombing missions, and laid many sea mine fields. The main focus was on the western parts, which they served from the Heligoland station or North Sea ports. This quickly became clear in a message on September 11th 1939: “The German Government has broadcasted a warning to all ships to stay out of three dangerous zones near the entrance of the Baltic. …The announcer said that the second and third zones must not be entered at all and the first one only behind a pilot ship. Presumably these zones have been mined.” (NYT, Sept 11 1939) Mining continued throughout the next months when a German cruiser Nürnberg laid mines off Kristiansand/Skagerrak on December 5th. __The Swedish fishing boats Hugin (6.10. ), Essie (23.10.) and Elly (6.11.) are lost in the Skagerrak due to air mines. __“Seven crew members of the Swedish battleship Manligheten were killed today in an explosion while investigating a floating object in the vicinity of Göteborg….A small boat was sent to retrieve the object. Suddenly there was a terrific explosion” (NYT, December 14, 1939). The weather may have reacted quickly. The light vessel ‘Skagens Rev’ reported frost on 6 days during December 7-15 and extended sea icing in the Skagerrak was observed in mid February 1940. At the same time reports went out: “It is Denmark ’s worst winter since 1860” (NYT, Feb 15, 1940). The sea ice in the Skagerrak disappeared before the end of February. An individual handling of a very small area covering a small percentage of the entire North Sea , the German Bight, can be done here only in general, which is nevertheless worth looking at reasons that supported sea icing during the first war winter. However it needs to be reckoned with that the entire North Sea was under severe stress from intensive naval operations. They occurred from Dover to the outlet of the North Sea at the Shetland Islands and beyond from the first day on, and continued relentlessly. Nevertheless, the German Bight during the first few war months was under a particularly high military stress that most likely contributed decisively to very early, severe, and long lasting sea ice conditions along the entire German west coast, as it had rarely been observed before. The small 1km² red sedimentary rock island Heligoland was the starting point of many naval warfare activities of the Kriegsmarine and attracted numerous naval and airplane missions from Britain during the first war months. Here in the Heligoland Bight, which is part of the German Bight, the intensity of the anthropogenic forcing on the marine environment outnumbered by far other naval activities elsewhere in autumn 1939. During the first couple of weeks that were topped by a huge mine laying operation from the border of The Netherlands to the geographical latitude of Dundee/Scotland and the Skagerrak . 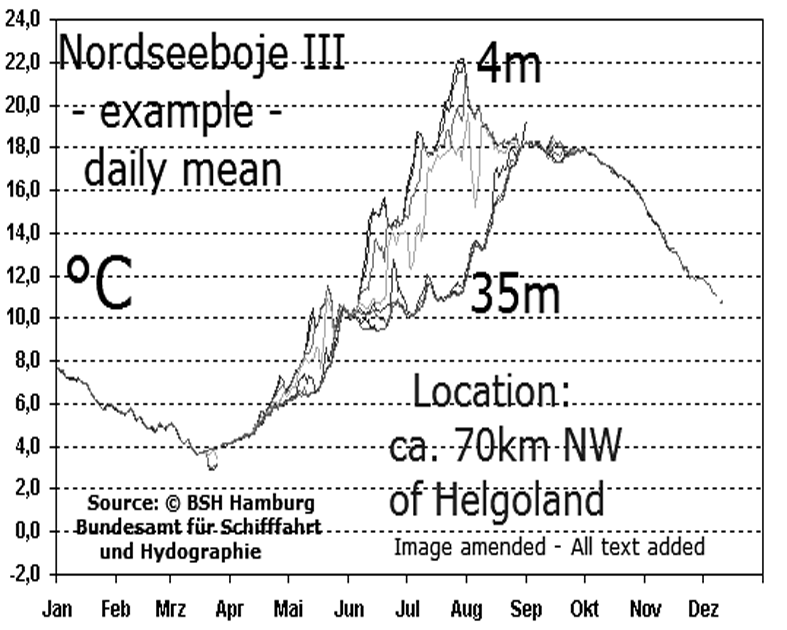 The general sea water conditions in which the Kriegsmarine operated, has uniform water temperatures over the full depth range since about September 1st with 18°C that declined until the end of the year to 8°C, and by another 4°C until the middle of March, as shown in the image: Nordseeboje III (NSB-III, Figure below, C7-7, roughly located about 70km NW of Heligoland. Here the salinity is roughly between 30 and 34psu. Together with the cooling at the sea surface and the tidal current, uniform conditions are ensured during the winter season. Further out in the North Sea and in areas with deeper water, there is greater temperature diversity even during the winter. When planting sea mines in sea areas with different sea temperature and salinity structure, the effect of exploding mines will be different. The impact is as simple as stirring coffee, or soup, to cool them down. Actually the German Navy called its endeavour to plaster the German Bight with sea mines “Westwall”, which stretched from a distance of between 50 and 100 km off the coast of Schleswig-Holstein and Denmark from Holland to a position: 56° 30’ North and 4° 25’ East. That was about half the distance between Skagerrak and Scotland . 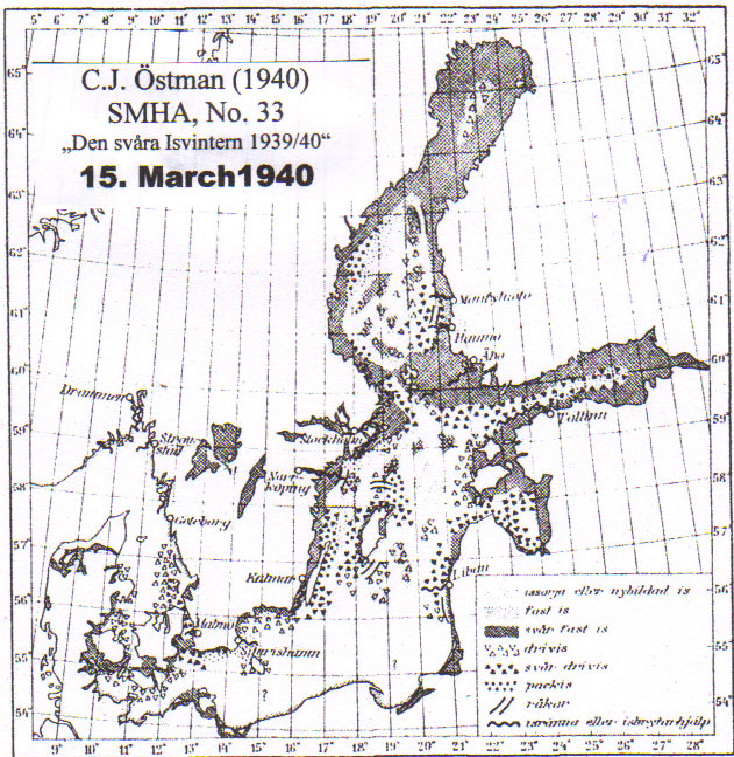 The first minefield locations were off Terschelling, Esbjerg , near Heligoland and two places off Jutland . (NYT, Sept 05, 1939) Specific warnings had been given to more than 100 Danish fishing vessels from Esbjerg . (NYT, ditto) It was reported that one unidentified boat had been blown up seventy miles west of Wyl light ship. (NYT, ditto) For about three weeks a flotilla of at least 25 naval vessels was engaged in laying mines along the “Westwall”. My efforts to verify how many mines the flotilla had planted within the first few weeks were in vain. At least for me it was not possible to get reliable figures about the stockpile the Germans had on September 1st. The number of mines laid during the period in question could be as few as 20,000 or as many as 200,000. But as the distance from Terschelling to 56° 30’ North is about 350 kilometres (170 nautical miles) and as the deployed 25 naval vessels were able to put at least 6000 mines in place per day it seems reasonable to assume that, by the end of September at least the first 20,000 to 30,000 mines and by the end of October another 20,000 were positioned. In a number of missions Home Fleet’s surface vessels laid mines close to the Axis shipping lanes and channels, e.g. the British destroyers Esk and Express laid mines at assumed ‘exit channels’ close to the “Westwall” as early as mid September, while the British East Coast was frequently supplemented with contact mines laid by surface vessels and magnetic mines laid either by German naval vessels, U-boats or air planes. But that is not the end of the story. Many mines exploded prematurely, others by bombing intruders, or by rough seas, or because a neighbouring mine exploded, which cold even blew up a row or field of mines. Such incidents could have happened many hundred times per day, but nothing has been recorded in this respect. It seems to be reflected in the much higher sea water temperature (SST) deviation in September 1939 (see Fig. C5-5). Actually it is a record. 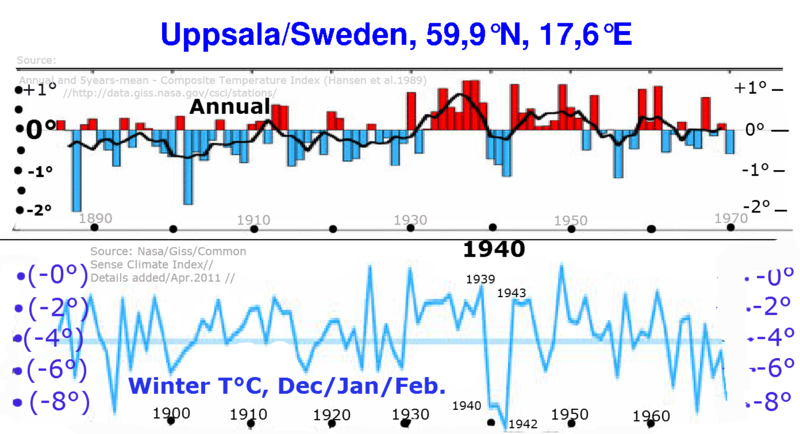 The significant lower temperature stays during the remaining months of 1939. The colder water contributed to an early and more severe period of icing. · December 11, 1939 ; Heligoland reported frost on December 11 and December 13-19 (from December 14-18 mean temperature of -1.6°C; December 15, mean temp. -3.6°C; lowest December 16, – 4.5°C; and frost from December 26-31. · December 16, 1939 ; Ice on river Elbe, (e.g. Glückstadt , Hamburg ), remained continuously for more than 90 days until mid March, 1940. · December 17, 1939 ; Tönning (near Husum) reported first ice, which remained for 100 days Note: Before icing commences along the German North Sea coast, the air temperature needs to be below zero for about 4 to 5 days. · December 17-21, 1939; almost all observation stations along the German coast from Nordstrand (island south of Sylt and Amrum) to Borkum report the emergence of sea ice, remaining in the south for approximately 60 to 70 days, and further north of Cuxhaven for 70 to 102 days. North of Husum (Amrum, Sylt) ice remained from early January for approx. 60 days. · December 29-30, 1939 ; during the night of 29/30 a strong southwest storm swept through Helgoland Bight (Heligoland up to 11 Beaufort). At the same time in the far east of Germany ( East Prussia ) very cold air of more than -20°C, had been blowing from the North and pushing further south. · A temperature overview for locations along the German coast is given in Figure C7-6. · January 2, 1940 ; Esbjerg – soft or new ice, navigation not hindered, Danish light buoys were withdrawn over the next 10 days. · January 6, 1940 ; Drift ice in the East Scheldt . Ameland temporarily cut off from the mainland by ice. River Maas is frozen over from Woudrichem to Heusden. · January 14, Drift ice on river Scheldt reported to have torn buoys from their mooring. Simultaneously it was observed that “in these nine days conditions have deteriorated very rapidly and one sees the first real indication of somewhat abnormal conditions, most particular is the freezing of rivers Scheldt and Maas ” (Frankcom, 1940). · January 20, 1940 ; Difficulties due to ice reported in the river Scheldt . · January 21, 1940 ; Heavy ice drift reported on the west Scheldt . · January 23, 1940 ; more difficulties due to ice reported on river Scheldt . Many small vessels bound for Antwerp were diverted to Flushing because of ice. Navigation to Brussels was closed by ice. Fast ice reported at Lobith, on the river Rhine . 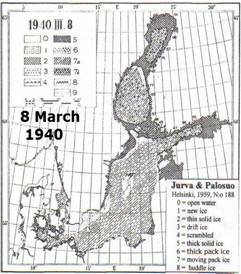 A report which was concluded on January 23, 1940 , noted already: “…the spread of ice out into the North Sea itself is a definite indication of unusually severe weather. It is particularly unusual for shipping to be held up on the river Scheldt .” (Frankcom, 1940). For any climatologist interested in detecting what man needed in order to change climate, the development of the sea ice in the Gulf of Finland offers one of the most thrilling evidential interrelations. Within a small region, and in a rather shallow water body with not more than an average depth of 38 meters, naval armadas consisting in total of about 200 ships, can do a lot of mixing within the sea water column. The surface vessels operated not alone but together with costal batteries and hundreds of bomber airplanes. Explosions occurred above and under the sea surface of the Gulf of Finland for about six weeks, before a complete and severe sea ice cover terminated any further operation at sea. That proved to be a great weather experiment with climatic implications – from a scientific point of view. “January 15 the sea of the Gulf of Finland was still open as far east as the meridian of Pellinki. In the Gulf of Bothnia the Bothnian Sea was also open for most part. 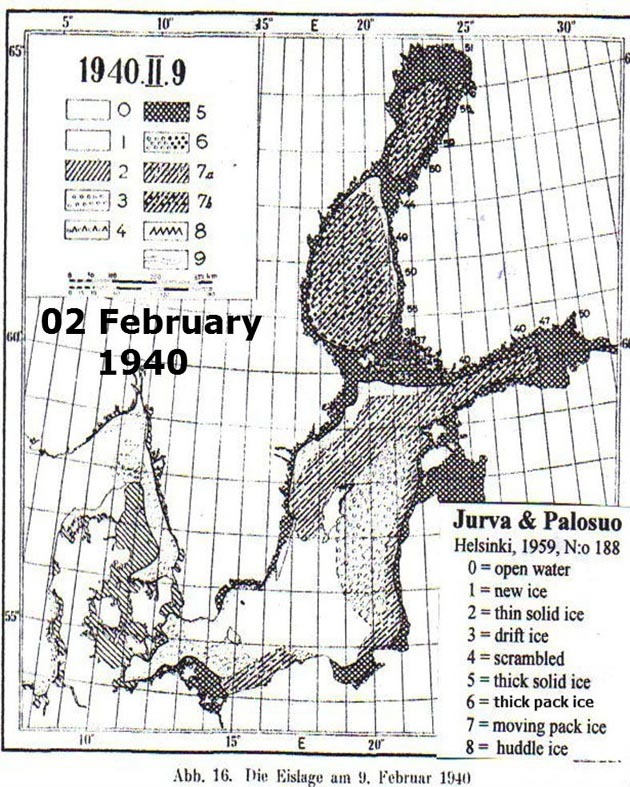 Ice that formed rapidly on the parts of the still open sea, and on January 27, with a fairly weak 3-4 Beaufort NE wind blowing, the northern Central Baltic even, off Utö, froze (Palosuo, 1953). How could this be possible? Why did the water not freeze when the temperature stayed below –10°C over a longer period of time? Were the physical laws out of order in the Gulf of Finland in January 1940? Under normal conditions, the Gulf should have been closed by about January 21st. At least that is the rule nowadays, as indicated in Fig. 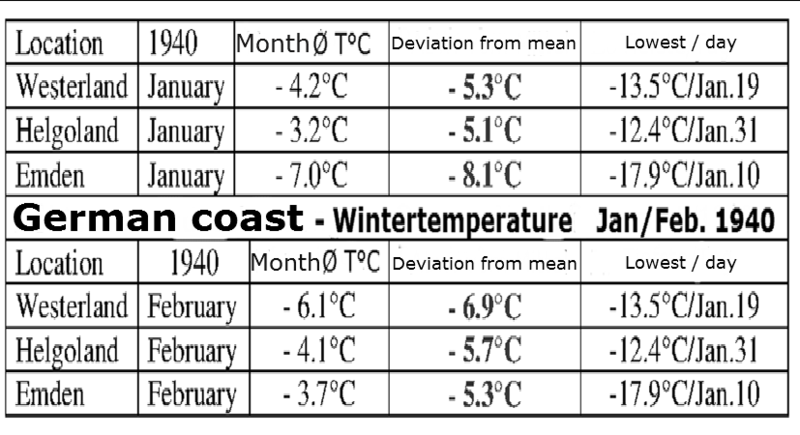 C7-8, according which the Gulf of Finland is covered with ice around January 21st, although the mean air temperatures are considerable higher, especialy in December 2.2°C, and in January 8.2°C higher than in winter 1939/40. This is not possible under normal conditions. It is only possible if an external force has stopped, or delayed the freezing process. As there had been no reports on unusual wind conditions, only one force on earth remained, mainly naval warfare, until the ice cover ended fighting at sea. Sea icing in the Gulf of Finland depends on two principle conditions. First, the surface layer develops an ice cover due to low air temperature, which means that lower water layers may still have temperatures well above freezing temperatures. Second: the water body is churned and turned by external forces so intensively that any heat reserve is squeezed out, so that the water is freezing regardless of how much it is moved and turned any longer. The latter case is what happened in winter 1939/40 and delayed freezing under the prevailing cold temperatures for such an extended period. 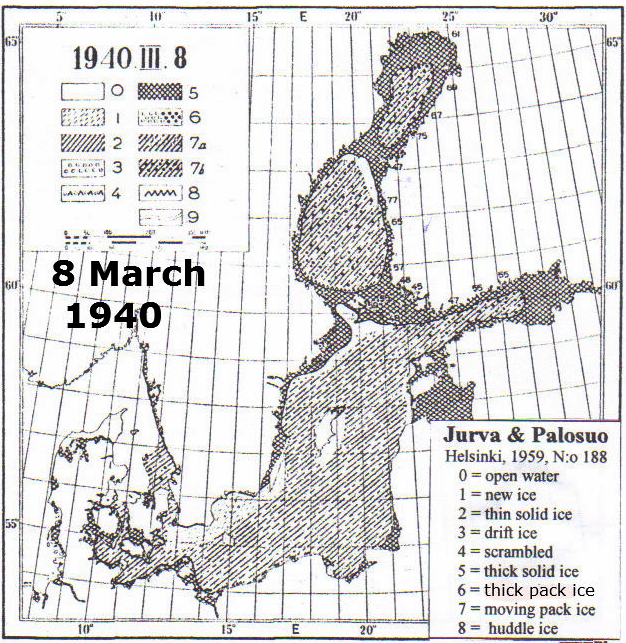 Someone who has taken note of what happened in the Gulf of Finland from November 30th until complete icing at the end of January 1940 will have difficulties in coming forward with an alternative explanation for the delay of the sea ice processing, which eventually was part of the severest Baltic icing after a period of about 60 years. 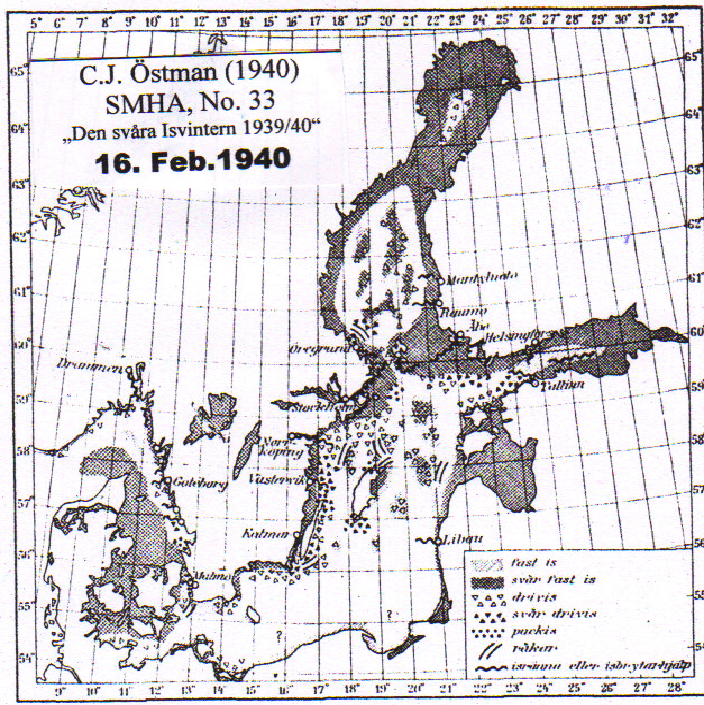 Here is a selection of events, related to the sea body of the Gulf and correlated weather conditions, over a couple of days since November 30th, 1939, as the total number from shelling, mining, torpedoing, depth charging, and bombing will go into many thousands until the moment the Gulf was fully covered with sea ice. · Russian forces seized the four undefended Finnish islands ….after heavy aerial and naval bombardments. · Sent warships westward through the Gulf of Finland, perhaps for bombardments against Helsinki from the sea. · Occupied several centers in the Finnish territory…using about 100 ships and boats. · Bombed from the air and attempted to seize the peninsula of Hango , seventy-five miles west of Helsinki …..
· Bombed the 3,900-ton Finnish warship Ilmarinen…..” (NYT, December 1, 1939). · Gulf of Finland „The (Russian) commanders of transport ships and torpedo boats were so afraid of being attacked by Finnish submarines, that they set off depth charges every 15 minutes, or whenever an unconfirmed sighting of a periscope was made, resulting in a total of 400 depth charges being dropped by the end of operation that day” (van Dyke, 1997). · The Baltic Fleet cruiser Kirov and two destroyers shell the Finnish island of Russaro , which returns the shelling (Rohwer, www). · On the first day of invasion, Baltic Fleet bombers spotted the two Finnish battleships anchored off the island of Russaro . Within two hours the Baltic Fleet command sent eight long-range bombers. As the ships had meanwhile disappeared, the squadron dropped their 600 bombs on Helsinki ; two additional squadrons were sent out to destroy naval air fields around Helsinki ; they managed to destroy 12 airplanes and several hangars while losing two of their own bombers by Finnish anti-aircraft fire (Van Dyck, 1997). · December 8 - 9, 1939: The Finnish coastal batteries on Koivisto carry out gun duels with Baltic Fleet shelling forces, consisting of the battleship Minsk, two destroyers and three gunboats (Rohwer, www). · December 18, 1939: A squadron of the Soviet Baltic Fleet (one battle ship Oktjabrskaja Revolutsija, five destroyers and further support vessels) shelled the 254mm Finnish coastal battery at Saarenpaa on Koivisto, with the arrival of a further battle ship, Marat, on the 19th. Also planes bombed the island (Rohwer, www). „The Finnish coastal batteries have been in lively combat for the last few days. Time and again they have been attacked or bombed by Russian planes. The coastal batteries around Koivisto have been especially exposed to bombardments” (NYT, Dec. 20, 1939). · A battleship and at least five other naval vessels from the Baltic Fleet shelled the Finnish shore batteries at Saarenpää und Tiurinsaari from 30/12 to January 03 1940 . · January 8, 1940 : A record frost today covered Northern and Central Russia , with the thermometer at 31 degrees below zero Fahrenheit (-35°C), and impeded normal activity. (NYT, Jan. 09, 1940). · January 13, 1940: Riga/Latvia; The most bitter cold wave of years, which sent temperatures in Baltic countries to as low as 40 degrees below zero Fahrenheit, ended abruptly today. The mercury rose rapidly to a few degrees below zero Fahrenheit. Parts of the Baltic have frozen over, and floating and pack ice are likely to interfere with shipping for some time (NYT, Jan 14, 1940). · January 18, 1940 ; Helsinki : “Pitiless, deadly cold laid a glacial cover on Russian’s war machinery tonight… near Salla, above the Arctic Circle . Phenomenal 54-degrees-below-zero temperature (-48°C) restrained the Russian air forces… and apparently immobilised Russian ground forces, which have been attacking on the Karelian Isthmus (NYT, Jan 18, 1940). · January 18, 1940 : Temperatures of more than 50 degrees below zero Fahrenheit were reported from several points. At Nickby, northeast of Helsinki , a temperature of 58 degrees below zero was recorded – the coldest since 1878. It was 11 degrees below zero in Helsinki (NYT, Jan. 19, 1940). · January 20 1940; “Thus they are able…to relieve men exhausted by a week of fighting in temperatures plunging to 60 degrees below zero” (NYT, January 21, 1940, p.23, left 1st column). · January 21, 1940 : “The cold polar air remained stagnant over vast areas of Europe and North America . Result: Some of the coldest weather in half a century. In Moscow the temperature on January 17th dropped to 49 degrees below zero Fahrenheit (-45°C), and in parts of Finland to 58 degrees below zero. Such temperatures can be measured only on alcohol thermometers, because mercury freezes solid at 38 degrees below zero” (NYT, January 21, 1940, Weekend in Review, Title: War in the Cold). · January 27, 1940 : Helsinki . “Victims of the coldest winter in sixty years…” (NYT, Jan. 27, 1940). Koivisto lost, Finns admit (NYT, Feb. 27, 1940). Even if some of the reports may have exaggerated several numbers, they are nevertheless breathtaking. Since December 20th the temperature conditions had been low enough to force the complete icing of the Gulf of Finland at a much earlier date than it actually happened. 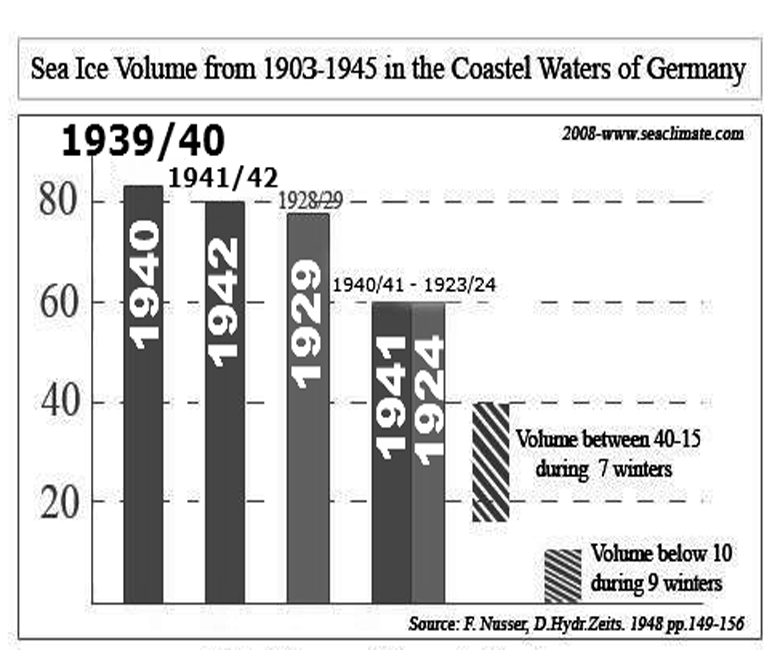 Those who regard the making of sea ice in the Baltic in winter 1939/40 as a natural variability are talking nonsense, and demonstrate how little they know about the influence of the ocean and seas. By January 15, the atmospheric pressure in Greenland had reached a remarkably high level (1065mb). As low pressure simultaneously prevailed in Central Russia (995mb) very cold air began to flow westward at high speed from the northern side of this low pressure area, and a very severe frosty period began in the region of the Baltic. The outbreak of cold air resulted in an independent cold air pool (“Kaltlufttropfen”) in Germany which persisted in the area for nearly a week. The cold air pool in the German area began to move on January 24 towards the Baltic region from where, reinforced, it pushed back to German territory on February 7. On February 12, its centre was in the region of Hamburg , from where, moving slowly, it arrived in East Germany about February 20. As a reminder: The City of Hamburg, which is close to the two sea areas that had been extremely highly churned and turned up-side-down by the Kriegsmarine, namely the German Bight and the southern Baltic from Kiel to Gdansk, experienced under the ‘Kaltluftropfen’ two of the coldest days and on February 13th of with -29.1°C the coldest ever measured (see Fig. C1-5, p. 44). This statement confirms the ‘weather blocking’ situation (see C5, p. 67f), which was man-made by stirring the regional seas. It is said that the German Luftwaffe lost about 50 air planes during the battel of Hel from September 9 to October 2, 1939 (http://de.wikipedia.org/wiki/Halbinsel_Hel). How many sea mines had been laid in the Gulf of Finland before or during the Winter War could not be verified. Presumably it had been a lot. A recent report by The Sunday Times, Feb. 12, 2010 , said that: Most of the 150,000 mines in the Baltic were laid by the Russian and German navies, particularly in the Gulf of Finland and the shipping lanes to St Petersburg .